SAM (Software Asset Management) is a business practice that involves managing and optimizing the purchase, deployment, maintenance, utilization, and disposal of software applications within an organization. It might require quite a lot of time to check the license policy complying, audit usage of existing licenses, and optimize expenses on purchasing software and updates. Our software auditing program can help spending less time on these processes and prepare handy reports of the software and license audit. Starting from the version 8.0, 10-Strike Network Inventory Explorer is released in two editions: the standard and the professional version (Pro). The Pro version of the program allows performing more detailed SAM processes and is oriented on using in large companies with a distributed structure. 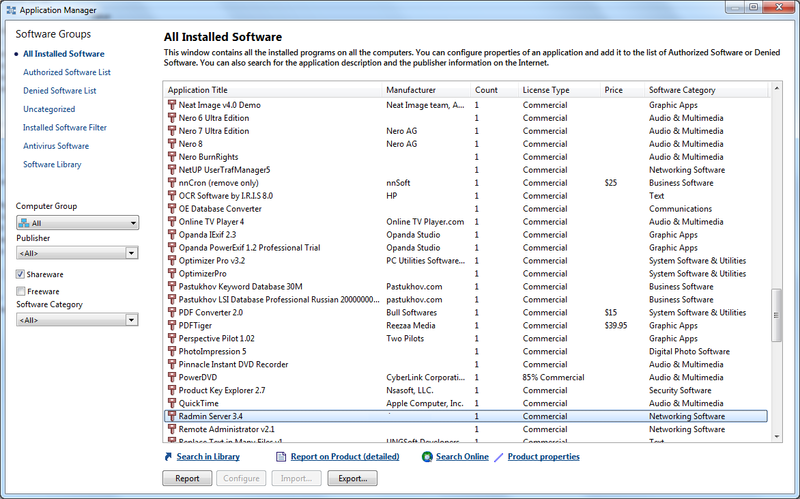 The Pro version has got a built-in Software Library containing more than 100 thousand software titles split by categories, with defined license types and prices. 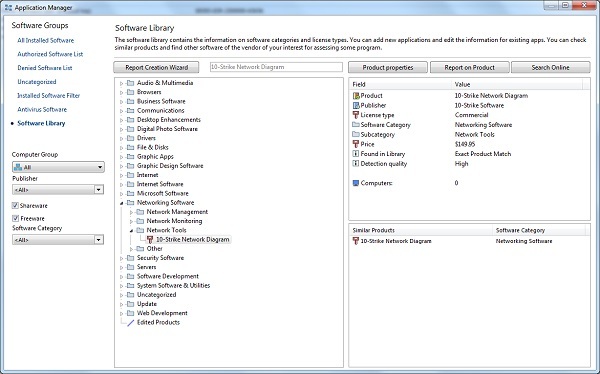 The Software Library allows to mark out paid products among of installed software, plan the unlicensed software uninstallation, maintain software assets, analyze categories, and create various reports on free and paid products. How can users of the Standard version migrate to Pro? Multiple user access with access right differentiation. Improving the database integration and synchronization. Improving the Active Directory integration and synchronization. 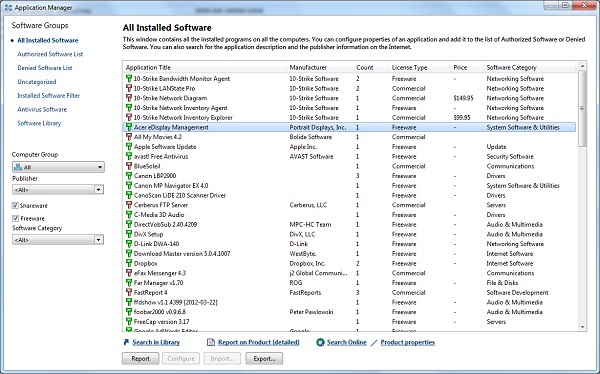 Central administration with ability of running scripts on computers and mass application deployment or uninstallation. Advanced statistics and analytics center. Further improving of the program's performance when operating big amounts of data. 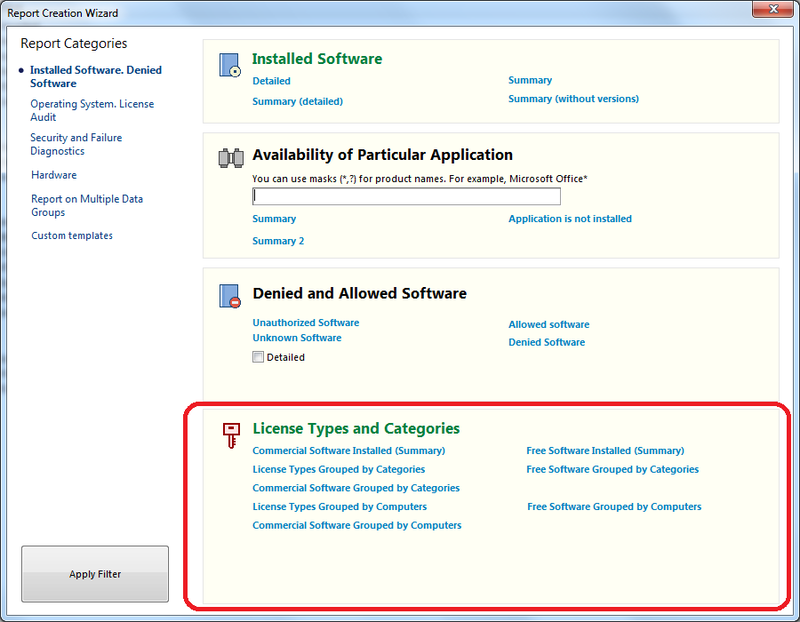 Information on license type, software category, and prices. Reports on license type, software category, and prices. 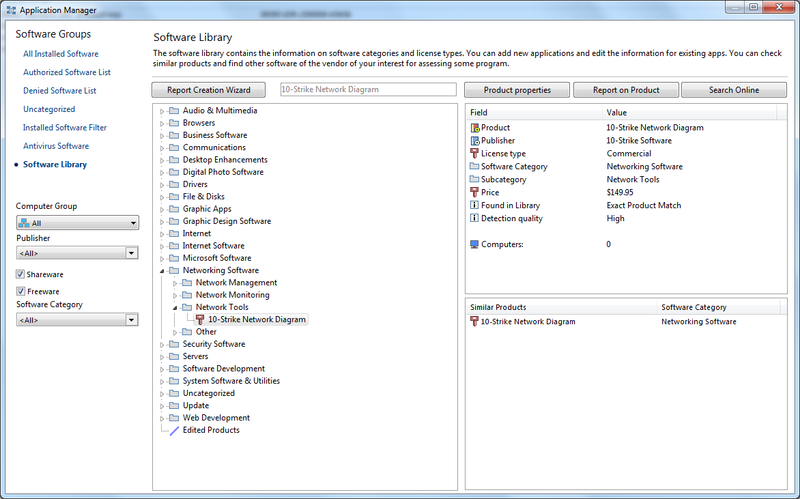 Additional information in the Application Manager. Software Library: viewing data, adding titles, editing. The program helps you to maintain the PC inventory. Gather the data over the network. Create reports on hardware and software. Monitor changes and PC health. Find problems, HDD overheating, etc. The program notifies you on the detected problems and important changes via email. The program is easy to setup and configure. Take control over your network computers! Download the program and try it for 30 days FREE. When buying a license, you will get free program updates and technical support within one year after the purchase.